Cabin Guides: Looking for student or adult Volunteers to educate visitors about the birth and childhood of our 20th President James A. Garfield. This is a great way to meet new people and share in an important part of history. mhhsohio@gmail.com. This position requires as little as 3 hours per month. Students are Encouraged to receive Service Hours. We will work with you based on your interest. We have opportunities in the community or you can work at home. We’d love to hear from you! Cabin Guides: Looking for student or adult Volunteers to educate visitors about the birth and childhood of our 20th President James A. Garfield. This is a great way to meet new people and share in an important part of history. This position requires as little as 3 hours a year. Event Planner/Coordinator: Again, a great way to meet new people. We have events we host and others we support. We need fresh new ideas if you have them! 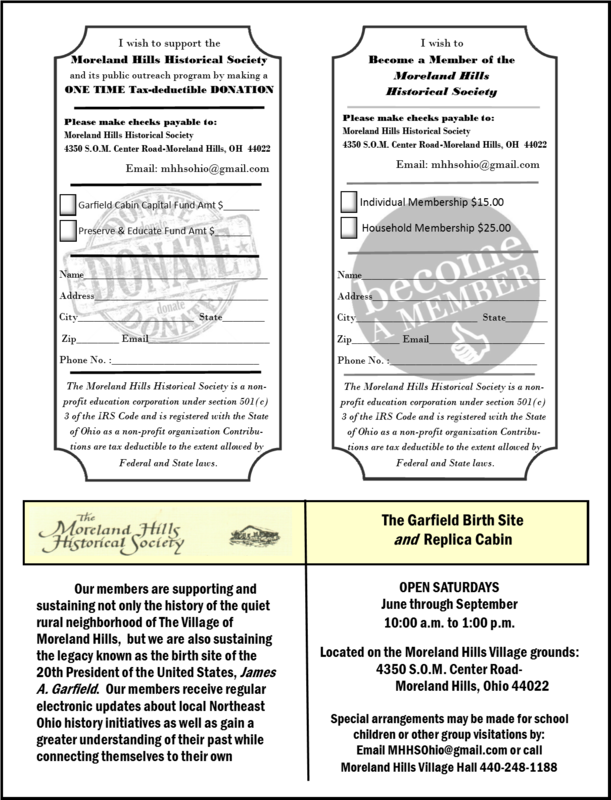 Historical Researcher: Your passion for the history of Moreland Hills will find a home within our group. We love tall tales, real tales and stories of yesteryear. Won’t you uncover the past along side us? Fundraiser: We could use your help acquiring funds to maintain and man the Garfield cabin and funds to helps us continue our preservation efforts.. Path Conservation and Clean up: The .25 mile path behind the replica cabin through the woods needs cleaned up and better identified. If your passion includes nature and conservation, we could use your help. We are especially appreciative of the strong foundation of our organization held together by its members and volunteers.